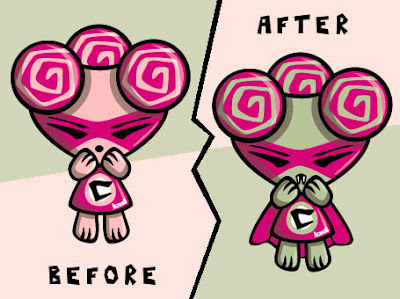 KawaiiPunk - Kawaii Mascot Blog: Creepily Cute Mascot! Ta da! As you can see this particular mascot makeover has something of a twist to it. Rather than trying to improve your look, by making you look even cuter, I’ve decided instead to make you look as hideous as possible - all in the name of Halloween, of course! I’ve achieved this remarkable transformation by changing your complexion, giving you some fangs, and dressing you in a full length cape - the perfect sartorial choice for many a monster! Looks great doesn’t it?